Mix together salt, garlic powder, cumin, oregano, coriander, and cinnamon in a bowl. Coat pork with the spice mixture. 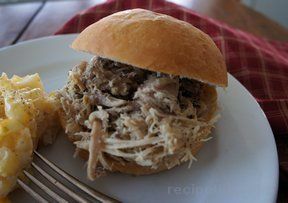 Place the bay leaves in the bottom of a slow cooker and place the pork on top. Pour the beef or chicken broth around the sides of the pork, being careful not to rinse off the spice mixture. Cover and cook on Low until the pork shreds easily with a fork, about 10 hours. 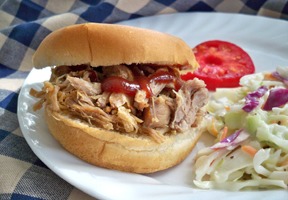 When the pork is tender, remove from slow cooker, and shred with two forks. Use cooking liquid as needed to moisten the meat. Serve in tacos or tortillas with your favorite fillings...salsa, sour cream, lettuce, rice, beans, etc.